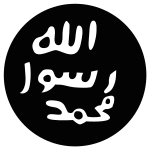 English: Muhammad (circa 570 - 632 CE) — Prophet and the founder of Islam. According to the Qur'an (Koran), Muhammad was the last of a series of prophets chosen to convey the divine message of Islam. Паказаныя 87 файлаў гэтай катэгорыі з 87. Гэтая старонка апошні раз рэдагавалася 10 жніўня 2018 году ў 12:28.